SEATTLE – The Seattle City Council approved a $15 minimum wage June 2, making it the place where the minimum wage will be the highest in the nation. Only minutes after the vote, however, there were reports that national franchises were planning to sue over what they say is mistreatment of large businesses. The increase will be implemented in stages, taking full effect in seven years. An organization called 15 Now has been collecting signatures for an amendment to the city charter that would phase the increase in more quickly – in three instead of seven years. After the council vote yesterday spokespersons for the group said no final decision has been made on whether to go ahead with the ballot measure. 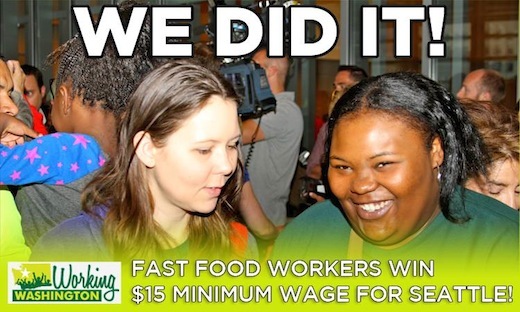 Fast food workers at the council meeting reportedly cried after the vote. The Seattle Times quoted Brittany Phelps, who makes $9.50 an hour at a Seattle McDonald’s and who had brought her 5-year-old daughter to witness the historic vote: “I am really happy, this means a lot,” she said, brushing tears from her eyes. 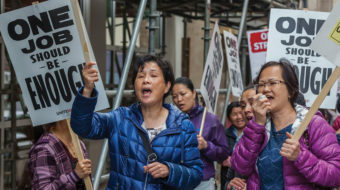 Workers at the council meeting reportedly shouted “Shame!” when the council voted down several amendments introduced by Sawant. Sawant tried to eliminate the provision that creates a training wage for teens and a provision that allows tips and health benefits to be counted as part of the wage for up to 11 years. After they voted down her amendments Sawant reportedly denounced her colleagues as corporate representatives posing as the progressive alternative to Republicans. The state AFL-CIO hailed the victory. “Today’s vote in Seattle will go down in history as a milestone in the struggle to raise wages and ensure fair pay for all workers. It is proof that when working people organize and make their voices heard, we all benefit. 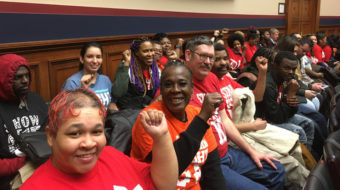 In just a year since fast-food workers in Seattle walked out on strike and sparked a movement for a $15 minimum wage, they have advanced their principle goal into law. Photo: Working Washington Facebook page.